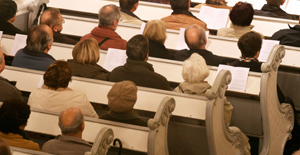 Most, if not all, church leaders would like to see their churches grow numerically in 2012. Growth is a sign of health. If a child is healthy, he or she will grow. Likewise, if a church is healthy, it will grow, both in quality (knowing Jesus more) and in quantity (making him known). Before healthy church growth can occur, there must be a solid foundation in place. The unified mindset of the leadership is a vital part of this foundation. Just as it is vital to stabilize the foundation of a building before you add a second story, so it is vital for the leaders to be of one mind and accord when planning for growth. 1. Examine your motives – Why do you want your church to grow? To increase your stats? To look good at the annual convention? Is your self-worth dependent on it? If it is anything other than the joy of seeing people come to know Jesus and grow as His disciples, you may need to deal with your pride. God will not allow us to bear fruit for the purpose of feeding our ego. 3. Realize that there are no quick fixes – There is no 4 or 8 week series or program that will serve as a miracle cure (or Miracle Grow) for your congregation. Many churches give up after the program does not produce the results they desired in only a few weeks. Growing your church by conversion takes time, hard work, and commitment. 4. Set the tone from the top – If you want a church full of people who share their faith, you as a leader must share your faith. That does not mean you only share it from the pulpit, but one on one with people in your community and family. Don’t expect your members to do something that you yourself are not willing to do. Your example is more powerful than your words when it comes to leading people in outreach. What are some other keys you have found for church growth by conversion?